Published: Feb 2, 2016 · Modified: Apr 12, 2019 · By Jen Sobjack · This post may contain affiliate links. 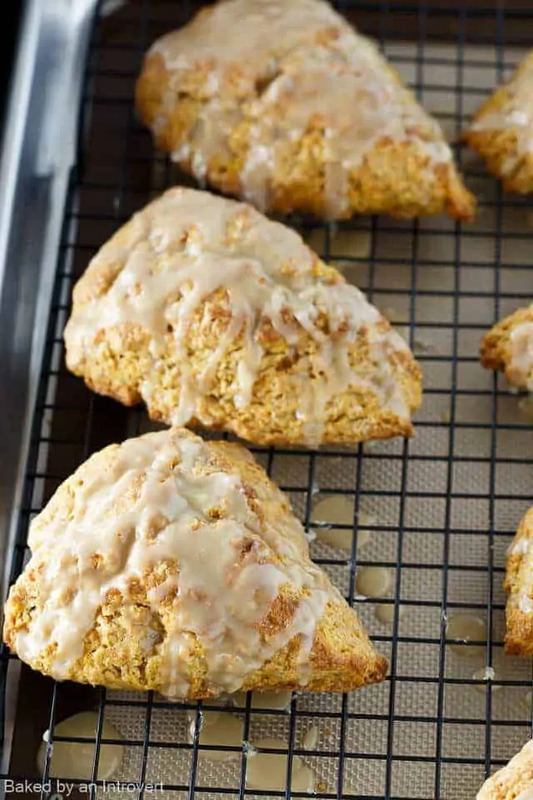 Delicious Sweet Potato Scone with Brown Sugar Glaze are the best scones you’ll ever try! They’re light and fluffy sweet potato scones topped with brown sugar glaze. Loaded with cinnamon and brown sugar, these scones will have you coming back for seconds. 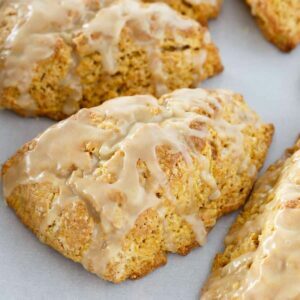 This recipe is adapted from these vanilla cardamom scones. The one and only scone base you will ever need! 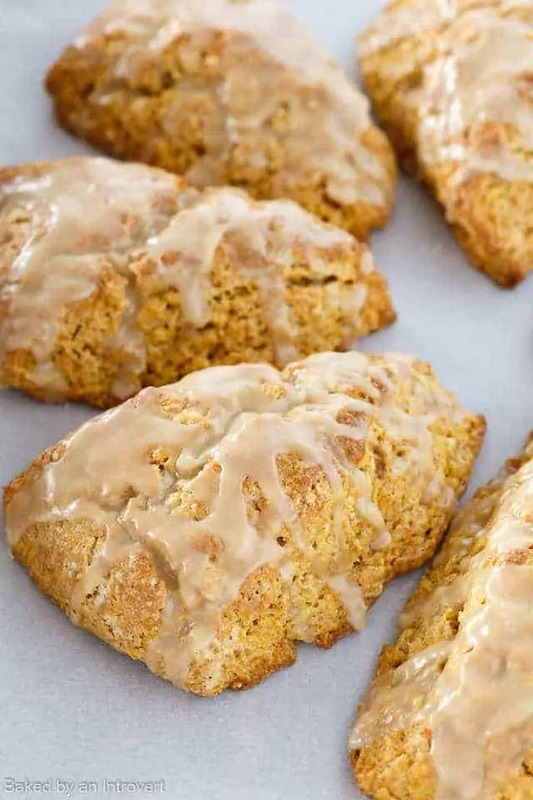 Smashed sweet potato, butter, and buttermilk give the scones a moist, tender interior with a crunchy exterior. Brown sugar glaze top the scones making them a delectable treat! Everyone has been on a “healthy” kick. That seems to be what January is all about. Eating healthier, lighter, and making smart food decisions. Well, guess what? January is over! It’s time to start putting some meat back on your bones and these scones are a great place to start. I have an avid sweet tooth when it comes to breakfast. Because of this, I usually just stick to a banana and yogurt. Both are sweet and good for you. But lately, I’ve been on a scone kick. You may remember a couple weeks back when I mentioned that I’ve found my one and only scone recipe. I can’t seem to stop making scones now. I want to use the base for all sorts of flavors!! I’ve made honey citrus sweet potato scones before but they were nothing like today’s recipe. Today’s scones are light and fluffy. Soft and tender on the inside with a nice biscuit-like crunch on the outside. And so, so good. The brown sugar glaze gives the scones an added sweetness. It’s like eating a baked sweet potato topped with butter and brown sugar. One of my favorite restaurant treats! Remember to handle the dough as little as possible and don’t overmix. You want it to be lumpy. You are going to love the intense sweet potato flavor in these buttery-soft scones. Light and fluffy sweet potato scones topped with brown sugar glaze. The most delicious sweet potato scone you will ever try! 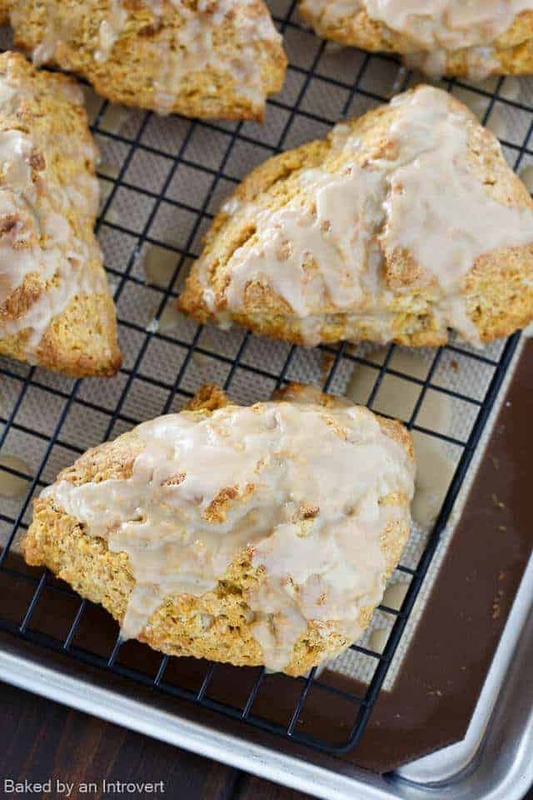 Loaded with cinnamon and brown sugar, these scones will have you coming back for seconds. In a large bowl, combine the flour, sugar, cinnamon, baking powder, baking soda, and salt. Stir with a whisk to combine. Using a pastry cutter, fork, or two knives, blend the butter into the flour mixture until it resembles pea-sized crumbs. In a small bowl or measuring cup, whisk the buttermilk, sweet potato, and vanilla together, then add it to the flour mixture. Stir just until the dough comes together, taking care no to over mix. Turn the dough out onto a lightly floured work surface and knead it gently about 5 times. Shape the dough into a 7-inch round disk. Cut the dough into 8 equal sized wedges. Place the scones on the prepared baking sheet. Brush the tops with cream. Bake for 15 to 20 minutes or until golden brown. Transfer the scones to a wire rack to cool slightly and top with glaze. Combine the butter brown sugar and cream in small saucepan. Cook over medium-low heat, stirring often, until the sugar melts and the mixture becomes smooth. Pour the mixture over the powdered sugar in a medium mixing bowl and whisk until smooth. Allow to cool before topping the scones.